Description: This phonograph is exactly what you need to play all of those wonderful records that you have saved over the years. Although records are hard to find these days, record players that work properly are even harder to find. 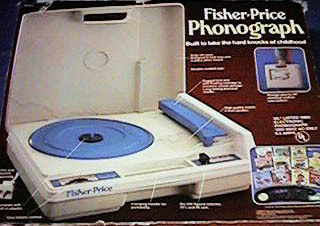 Leave it to Fisher-Price to invent a small lightweight record player that plays both standard 33 and 45 speed records, has quality 4-inch speakers, and simplified controls that make life so much easier. The phonograph comes complete with it's own built-in carry case for easy portability and storage. Designed for children ages 4 years and older. 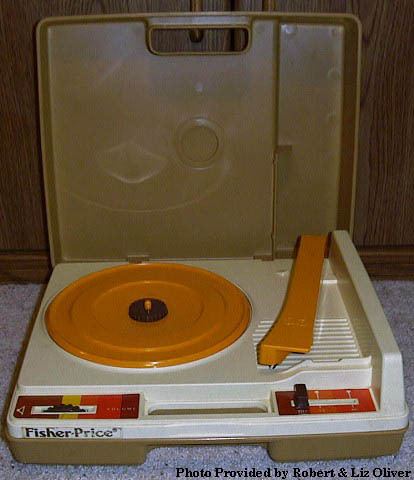 FPT19655 - Tan and white portable electric-powered record player with a long plug-in cord. The player has a brown knobby Volume control knob with a brown, orange, and yellow lithograph around the knob. The player also has a brown sliding button to switch from "Off" position to "33" or "45" RPM (has a brown built-in adaptor to play 45 speed records). The phonograph has a tan base and tan hinged lid, a white record top, orange turntable, and an orange needle arm. The player has a built-in carry handle for portability, uses a diamond needle, and has an AC power cord. NO LID. FPT8236 - Tan rectangular plastic lid that fits on the FPT19655 tan record player. The lid has an oval-shaped handle on one side. *FPT8205 - Tan plastic record player case (FPT19655) with lid (FPT8236). FPT19656 - Off-white portable electric-powered record player with a long plug-in cord. The player has a black knobby Volume control knob with a blue and white lithograph around the knob. The player also has a black sliding button to switch from "Off" position to "33" or "45" RPM (has a black built-in adaptor to play 45 speed records). The phonograph has an off-white base and an off-white hinged lid, an off-white record top, blue turntable, and a blue needle arm. The player has a built-in carry handle for portability, uses a diamond needle, and has an AC power cord. NO LID. FPT19478 - Off-white lid that fits over the top of the record player. The lid has an oval-shaped handle on one side. *FPT8207 - Off-white plastic record player case (FPT19656) with lid (FPT19478). FP825SET1985 - Complete set (1985-1989 white/blue version) in original box. 1984 - This set was sold in a 13-9/16" long, 11-13/16" high, 4-15/16" deep box. 1985-1989 - This set was sold in a 13-15/16" long, 12-1/16" high, 4-15/16" deep box. Sold with a one year limited warranty. Also see 1983-1985's #835 Fisher-Price Stereo System. Uses phonograph needle #BO 0824 (this is the Fisher-Price part number, but they no longer stock this part). Replacement needles for this phonograph are available at This Old Toy's Toy Store.